Are you sitting down? Ok. Here’s the thing. It’s totally sunny in Ireland this week! I’m as shocked as you are - but as delighted as I am with it, the weather poses its own sartorial challenges. When you’re not on the beach, and you’re used to wearing a million zillion layers for 360 days of the year, summer dressing can be hard. But hopefully, these urban summer essentials can be relied on to get me through summer in the city, in style. ONE: I first spotted this turquoise bauble necklace over on Chloe’s lovely blog and am impatiently waiting for mine to arrive! TWO: I love wearing natural materials in the summer and I’m stockpiling these organic cotton vest tops – they’re an absolute bargain! THREE: These olive green trousers from New Look are so easy and comfortable that I’ve picked myself up a second pair. They can be dressed up or down in a jiffy. FOUR: Clarks’ gorgeous metallic Studio Beat sandals are the perfect thing to dress up those trousers for the office – without sacrificing on comfort. FIVE: One of my favourites from the Essie Summer collection, Sunday Funday is coral meets tangerine, with a sprinkle of shimmer and lots and lots of shine. You’ll have swatches soon! 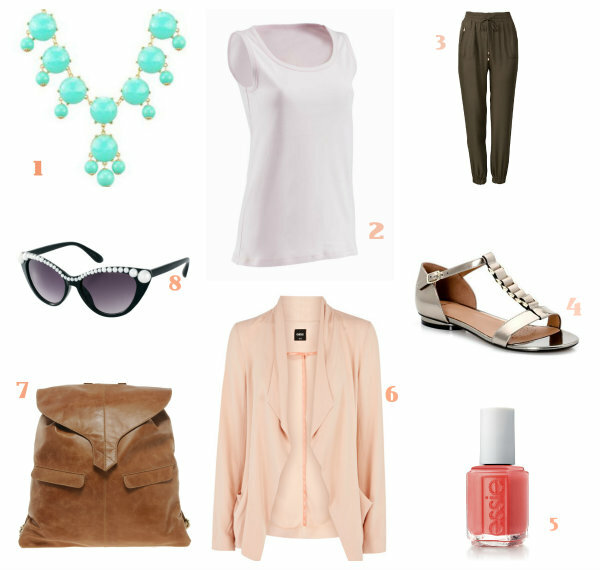 SIX: Ideal for the office, this lightweight, blush pink jacket is in one of my favourite ‘waterfall’ styles. SEVEN: In summer I like to trade my giant black bag for, er, an equally giant tan version. This luxe looking backpack (words I never thought I'd say!) is on trend and convenient. EIGHT: My usual sunglass style is very classic but these days I’m yearning for some statement eyewear - these ASOS beauties won’t break the bank. What pieces are you relying on this weather? Great picks, love the jacket & necklace! I love this ring and your nail polish. Very eye catching colours. i love that coral polish by Essie! I love everything you chose...the cardi and bag look so luxe. Love the relaxed sweater of #6! Loving number 1, 6 and 4. Great choices!I appreciate your visit dear, its always interesting to hear your views...Happy Friday! Love your picks! I'm also trying to pick out some of my summer essential!! A good maxi dress and bright nail colours are all you need.